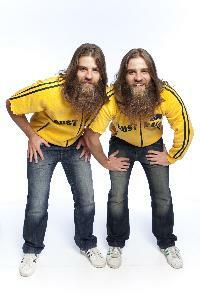 The Nelson Twins are one of the most unique stand up comedy acts in the world. Raised in rural New South Wales, they have been performing as a duo for the past 12 years. Their big bush ranger beards and cracking one liner jokes are just a part of an amazing act never before seen on the comedy circuit. Their TV credits include Australia�s Got Talent, The Footy Show, NBC�S Last Comic Standing, Australian IQ Test, Before the Game, The Project, National Geographic�s How To Win At Everything and a host of TV commercials. As well as being talented actors and comedians the boys are also qualified school teachers and have put their writing skills to good use and formulated a curriculum based program for secondary schools. Their ability to adapt material to young and older audiences makes them a �must see� for your next event.